good headphones, great audio quality full range, suports different audio files, firmware upgradeable tiny, good protective case. expensive for ammount of space but that pretty much it. I bought the iriver igp 100 a week before x-mas and I just love it. the igp 100 is a really great digital audio player. it is firmware upgradeable and the headphones it comes with are really great. its a tinny player with 1.5 gigs of space. It supports MP3, WMA, ASF and Ogg Vorbis files. it comes with a really good protective case. 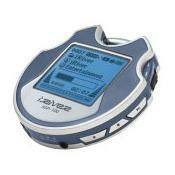 apple ipod 10 gig, iriver ifp, tdk mp3, rca cd/mp3.